Home > Old Unbuilt Kits > 1960-1969 > AMT 1964 Chevy Impala SS Hardtop, Stock or "Super Shaker"
Information: Molded in white. 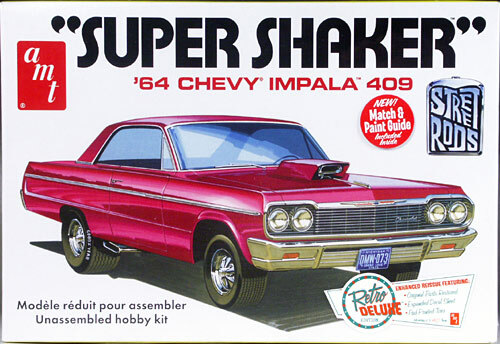 Can be built stock or as a "Super Shaker" street machine. Includes stock wheel covers and Cragar S/S mags, plus choice of Firestone Supremes with perfectly defined whitewalls or pad printed raised white lettered Goodyear Polyglas L60-15 tires. Build with a stock 409 or slap a blower on it. 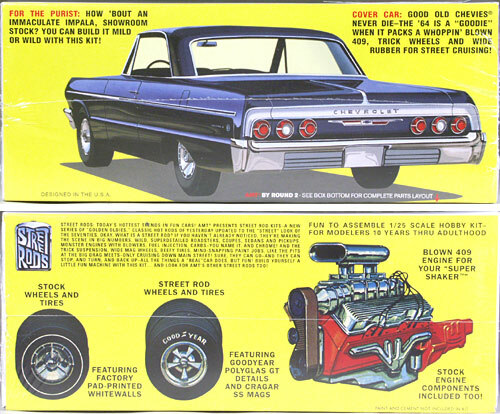 Highly detailed decal sheet includes decals from many issues of the '64 Chevy kit.